Coming soon: A custom jewelry designer's brand and website get a makeover from Shark. Sometimes rebranding takes an revolutionary strategy and we “ball up and toss” existing logos, typography and design. 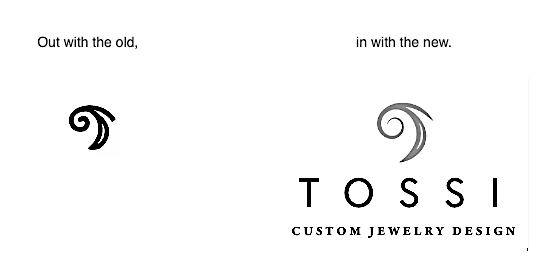 At other times, like this rebranding for a custom jewelry designer, we decided to preserve the original, artist’s self-made logo form (on the left) with more of an evolutionary design strategy. There is also a subtle name change, new url, and new website and small biz marketing program coming soon. Boosting conversion and engagement with video. Videos increases the length of time people stay on your page, giving your brand message longer to sink in. Think of video as the bait that draws people in – it's flashy, engaging, and keeps visitors focused on the page and away from the "Back" button. Video serves as validation for your product or service. If you feature yourself or company employees in the video, the trust factor is raised significantly because you're putting a face on your business. Video is a great way to answer those initial questions that a consumer goes through as they decide between you vs. your competition. People are lazy and prefer to watch instead of read. Humans are visual learners: it's the way we are programmed and it's the reason why TV is this generation's radio or newspaper. Keep your video short and to the point, but also make sure it's compelling to viewers. Video is changing the web and the way people interact with it. Boost conversions and take advantage of all that video has to offer, with video landing pages by Shark. Contact us today to learn more. Squarespace vs Wordpress / our build-a-bookshelf comparison. To understand the difference between Wordpress and Squarespace for building your next website, imagine that you want a new bookshelf for your office. With Wordpress, the process is like hiring a skilled, finish-carpenter or cabinet maker (your Wordpress programmer) to design and build the shelving. You have unlimited options for materials (open source programming code) and the design can be completely customized. With Squarespace, the scenario is more like choosing a contemporary, modular, shelving system from a high-end design and installation company. After reviewing a range of designs, colors, layout options and more, your shelving is specified and installed by a certified team. To make repairs or additions at a later date, (perhaps you want to add doors or panel to cover certain parts of the shelving), with Wordpress you will again, most likely need to engage the services of a finish-carpenter or cabinet maker (your programmer). With Squarespace, the process will be similar to having a catalog of options in-hand, and you then hire the same company to install the new shelving additions, or with Squarespace’s plug-and-play functionality, you could do it yourself. For developing and maintaining complex, multiple-language, and mission-critical web initiatives that serve as a gateway to secure applications Wordpress is our recommended platform. For companies that need a state-of-the-art website with SEO, digital and social media marketing integration, responsive display across desktop, tablet, and mobile, and some customized coding and technology, we recommend using Squarespace. Like having a customized mahogany shelving created for your office, Wordpress costs more. But if cost is a consideration and you can customize Squarespace's modular, plug-and-play components to your liking, then Squarespace is the way to go. And with less website development time, you can then get on developing an organized small business digital marketing program to build traffic to your website.